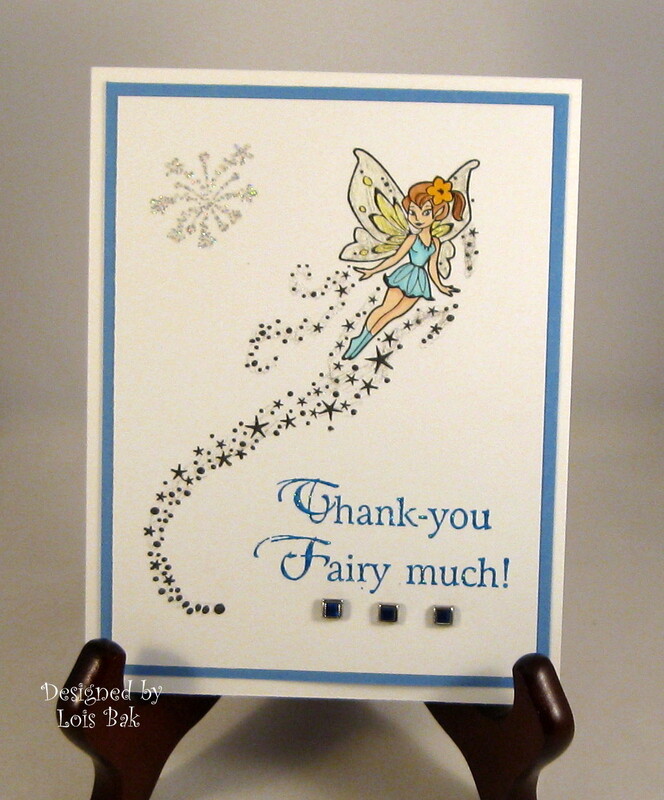 This is Frances' last challenge for February; and she asked us to use a Fairy on our cards in honor of National Tooth Fairy Day, which is today! My card could be used as a thank-you for the 25 cents (or whatever the going value of a tooth is these days) she left on someone's pillow. 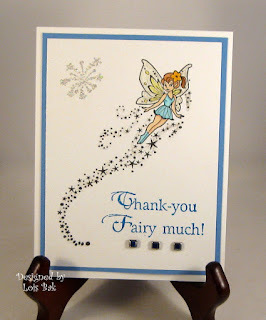 If you'd like to play along with us, pull out those fairy stamps and link your card up on the CCEE Stampers blog. Today's Speedy Fox and Friends challenge on the Mark's Finest Papers blog is to make something depicting your state. 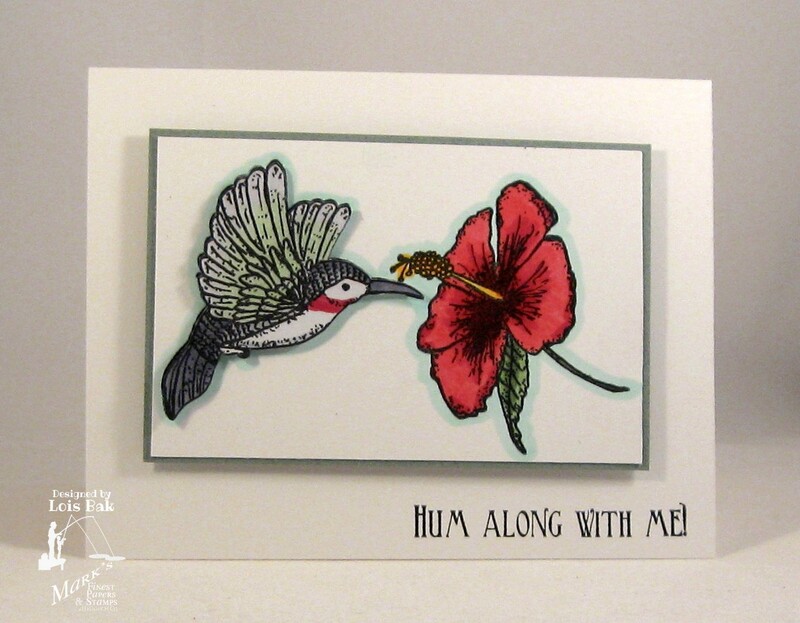 In my back yard I have a hibiscus bush, and it just so happens that MFP,aHC has a brand-new stamp set filled with these beautiful flowers -- Humming Along. I confess I've never seen a hummingbird in my yard, but I Googled "hummingbirds in Florida" and found that three species of hummingbirds do indeed live in Florida. The ruby-throated hummingbird is the most populous. We'd love to see what reminds you of YOUR state. 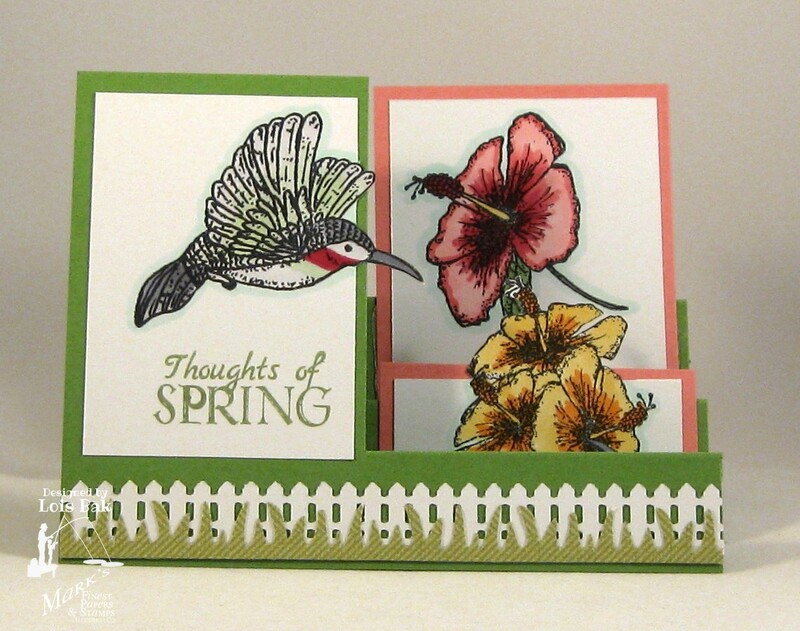 Make a card and link it up on the MFP Blog -- you could win a free stamp set. If you use MFP stamps, you get two chances to win! to win one of the above stamp sets! Just comment on the blogs listed below (don't forget this one) each day for more chances to win! (You do NOT have to comment on all the blogs each day. The names are drawn randomly. ) All four winners will be announced on February 23, 2013, on the Mark's Finest Papers blog. You can go back and comment if you missed a day. (HINT: The more you comment, the more chances you have to win; and comments on the MFP blog count twice!) The deadline for commenting is 11 PM EST on Friday, February 22, 2013. 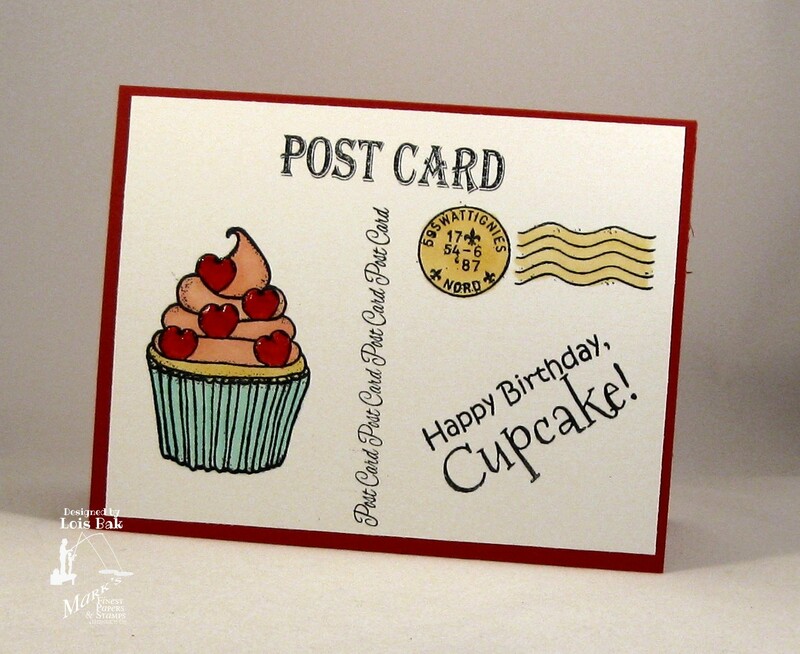 My first card uses both today's set, All Postal, and this month's mini set, Big Cupcake. I added some crystal lacquer to the hearts. My second card is pretty simple also. I made a smaller postcard and mounted it with pop-dots on the purple DP. I added some bling to dress it up a little bit, and I was finished. to win one of the above stamp sets! Just comment on the blogs listed below (don't forget this one) each day for more chances to win! (You do NOT have to comment on all the blogs each day. The names are drawn randomly.) 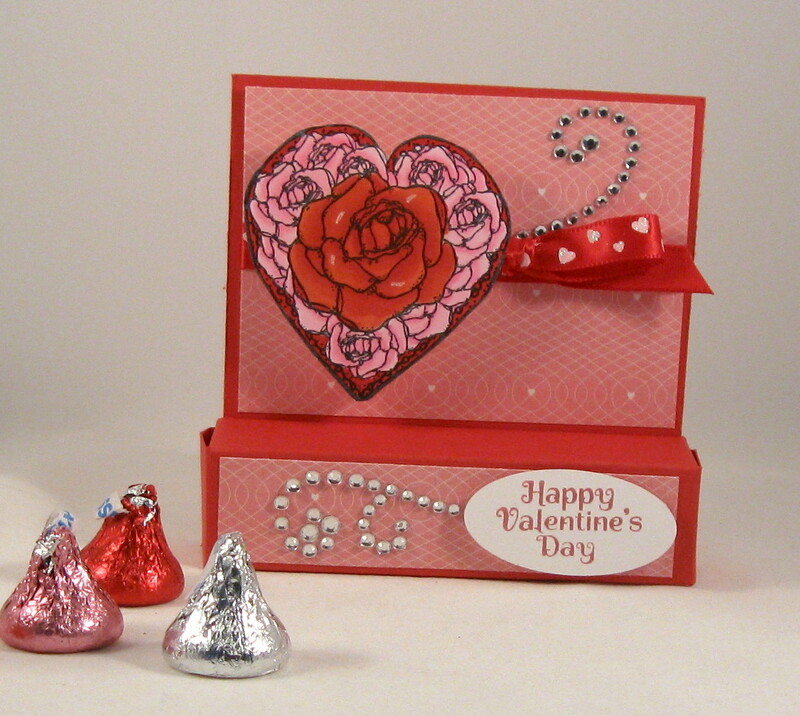 All four winners will be announced on February 23, 2013, on the Mark's Finest Papers blog. You can go back and comment if you missed a day. (HINT: The more you comment, the more chances you have to win; and comments on the MFP blog count twice!) The deadline for commenting is 11 PM EST on Friday, February 22, 2013. My first card using today's set, Rain Clouds, is serving two purposes -- the first, obviously, is to let you see the brand-new set; but the second reason is for today's CCEE challenge. 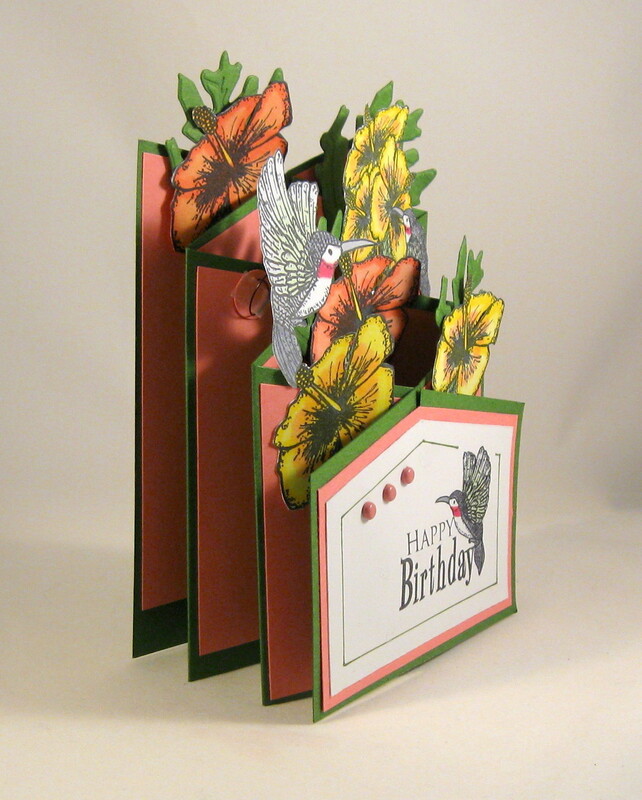 Frances gave the CCEE stampers a challenge to use as many "C's" on our cards as we could -- "C" for CCEE, naturally. 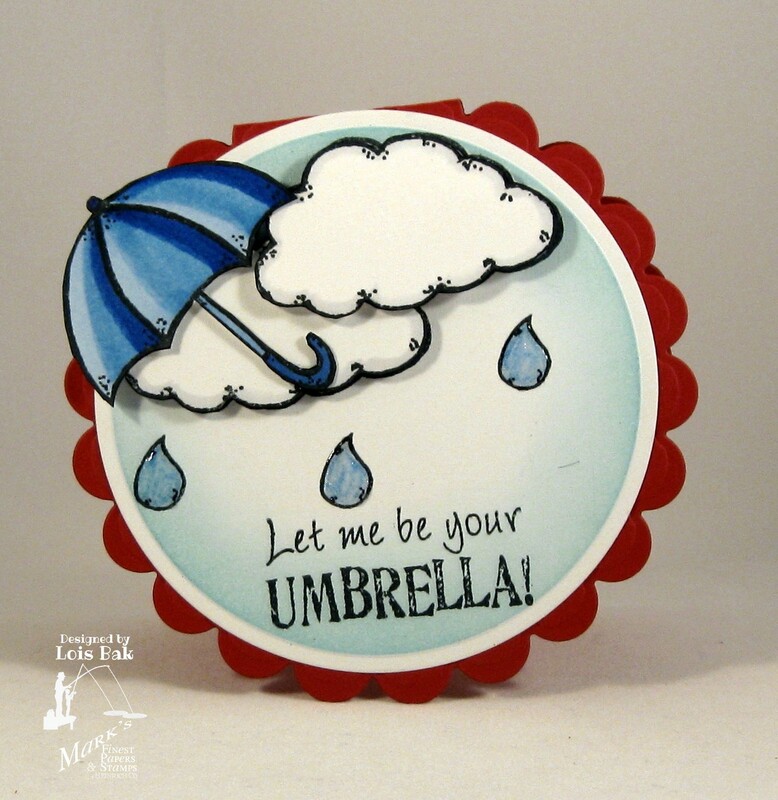 My card is circular, has clouds on it, and uses crystal lacquer on the raindrops. The name of the red MFP cardstock is Cherry Slush, and it's also supposed to cheer you up! 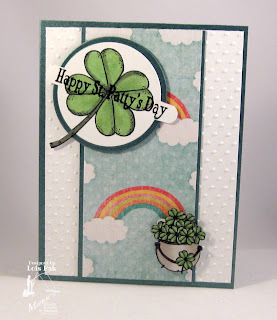 I found the fun patterned paper on my second card in Michaels last week, the same day that I found the rainbow paper I used on my Lots of Luck card on Tuesday. 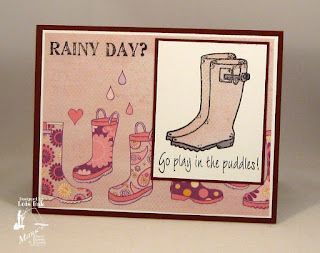 I thought it would go perfectly with the galoshes in today's set. 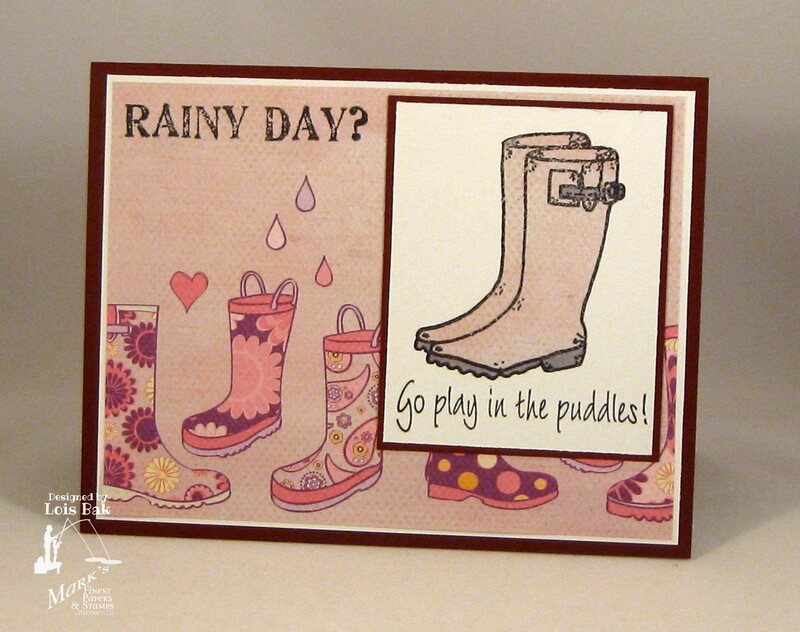 I stamped the galoshes onto the DP, cut them out, and paper-pieced them onto the sentiment panel. Pretty simple card. My first card today is called a Cascading card, and I learned how to make it while doing a Technique Lovers' Challenge on Splitcoaststampers. 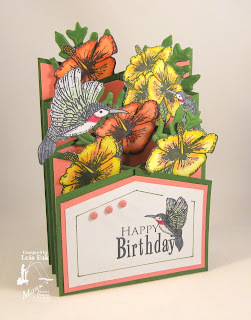 I used several of the single hibiscus blooms, one of the multiple blooms, and two single hummingbirds -- one of which has the sentiment included. Here you can see the side, showing the different layers -- and also you can see the spring on which the hummingbird is mounted so that he can "wobble." I used Patty's tutorial for this. My second card is a clean and simple one. I did stamp the hummingbird twice, cutting it out and popping it up. to win one of the above stamp sets! Just comment on the blogs listed below (don't forget this one) each day for more chances to win! (You do NOT have to comment on all the blogs each day. The names are drawn randomly.) 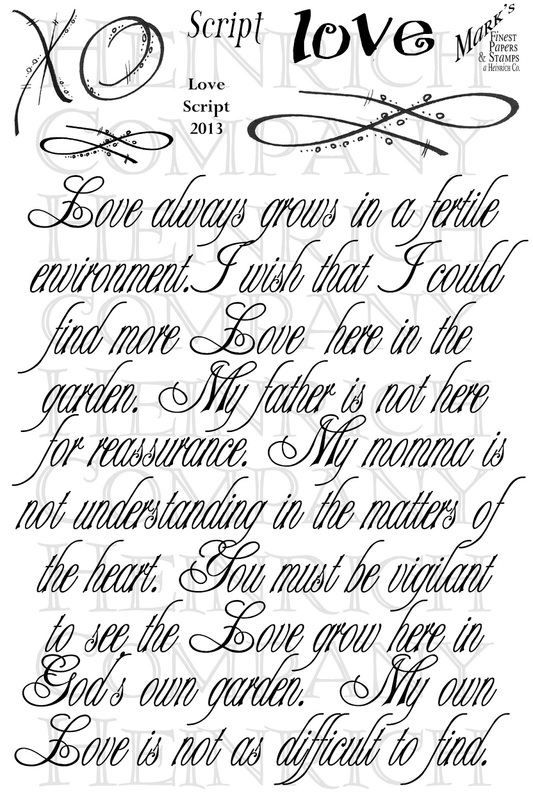 All four winners will be announced on February 23, 2013, on the Mark's Finest Papers blog. You can go back and comment if you missed a day. (HINT: The more you comment, the more chances you have to win; and comments on the MFP blog count twice!) The deadline for commenting is 11 PM EST on Friday February 22, 2013. I was in Michaels last week and found the perfect patterned paper to use with today's set, Lots of Luck. 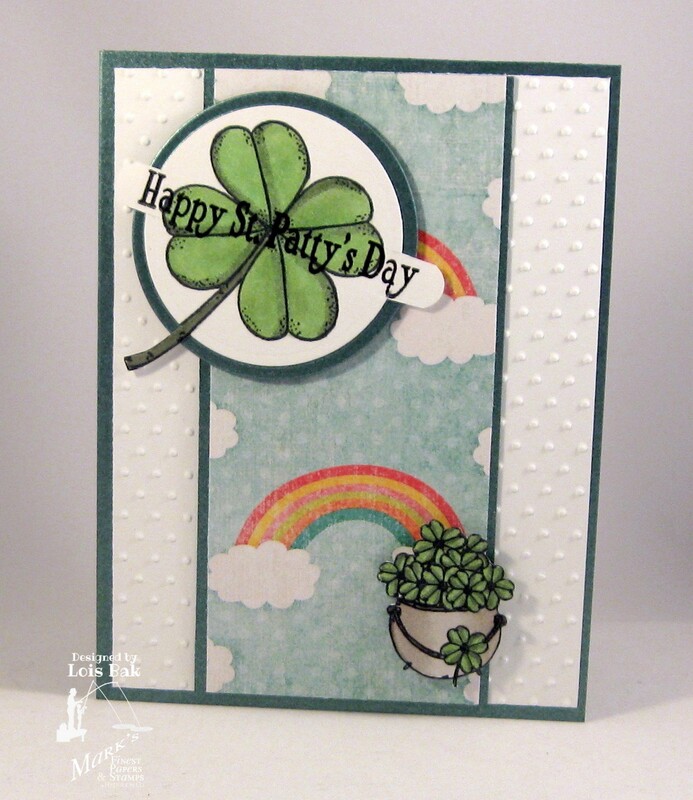 After cutting the strip of patterned paper, I positioned my pot of shamrocks at one of end of the rainbow. I cut the single shamrock using a circle nestie and the "out of the box" technique. I rounded off the ends of the words piece with my Word Window punch. 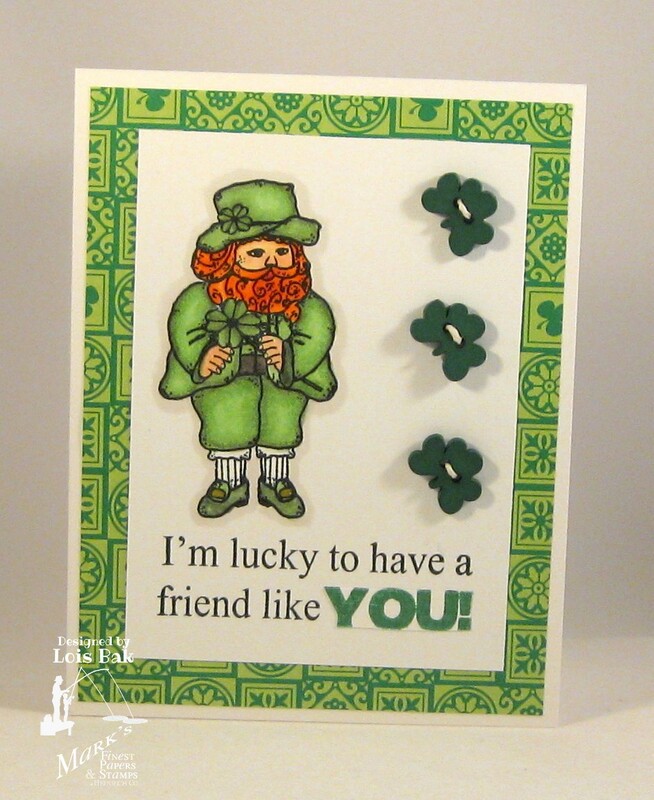 Even though I used the leprechaun on my second card, it is not necessarily a St. Patrick's Day card. I just added three shamrock buttons down the side. This week's Speedy Fox and Friends challenge is a color challenge -- pink, brown and white. I found some pretty designer paper that was mostly shades of brown with a bit of pink in it that I thought would work for today. I don't often make square cards, but this image cried out for it. I used the single dogwood image from Mark's Finest Papers Dogwood Blossoms and added a bit of pink. When I was a kid, we had two dogwood trees in our front yard that looked so pretty when they were in bloom. We'd love for you to play along with us over on the MFP Blog. Just make a card using pink, brown and white and post it at the end of the blog. You may win a free stamp set. If you use MFP images on your cards, you get two chances to win! 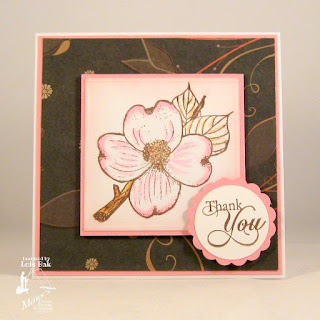 Frances gave the CCEE Stampers a very cool challenge this week -- a flat-backed treat box, the tutorial for which you can find here. We got bonus points if we included a heart for Valentine's Day. I'm all for bonus point! This was a fun project, and you can make it using one piece of regular 8 1/2" x 11" cardstock and some DP scraps. The heart, which is popped up on three pop dots so that it really stands out, is from a Mark's Finest Papers, a Heinrich Company, set called Love, Love, Love, as is the sentiment. 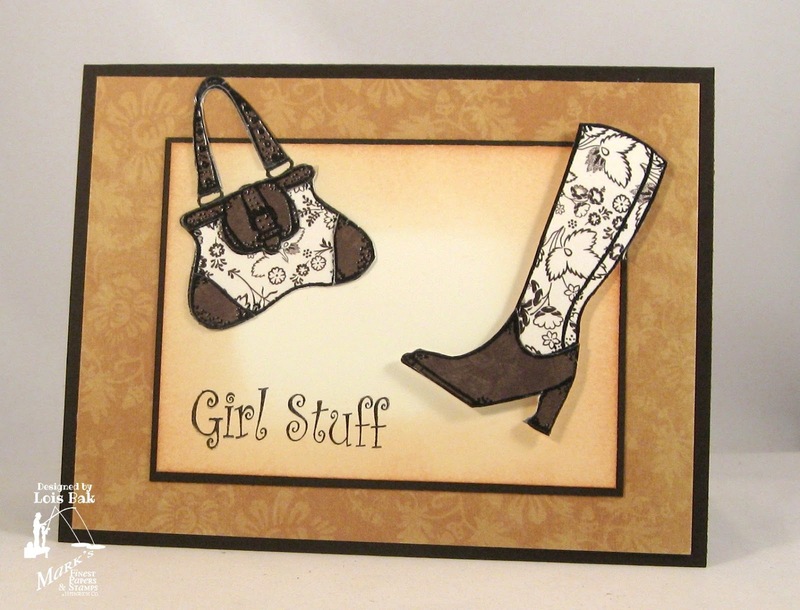 The DP is from a pack of MS valentine patterned paper. I found the ribbon and bling at Michaels. 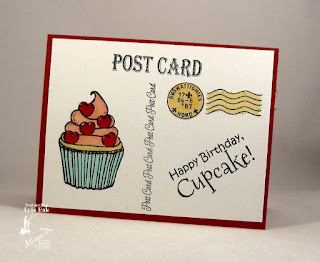 If you'd like to play along with us, check out the CCEE Stampers blog and link your card up at the end of the post. 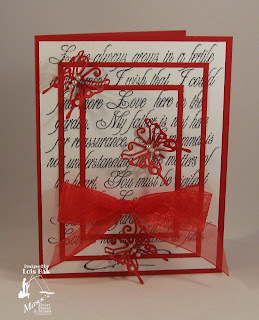 This week's theme on the Speedy Fox and Friends challenge on the MFP Blog is LOVE. Valentine's Day is right around the corner, so this was very appropriate. 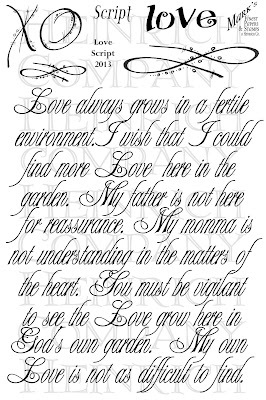 My card for the challenge is a sneak peek at a new set from Mark's Finest Papers, a Heinrich Company, called Love Script. This is one of my new favorite techniques -- Triple Stamping. 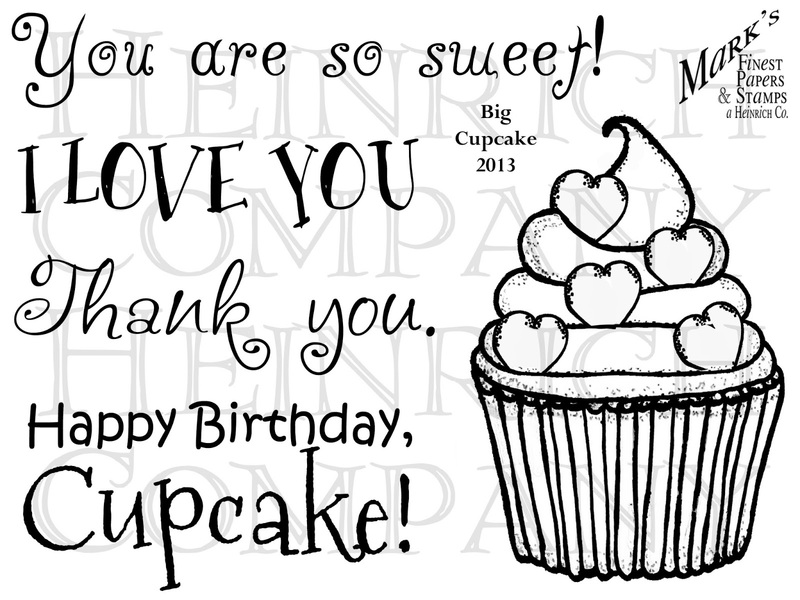 I lined up the three white layers and stamped the script background over all three pieces of cardstock. It didn't quite cover the entire bottom layer, so I stamped the flourish. 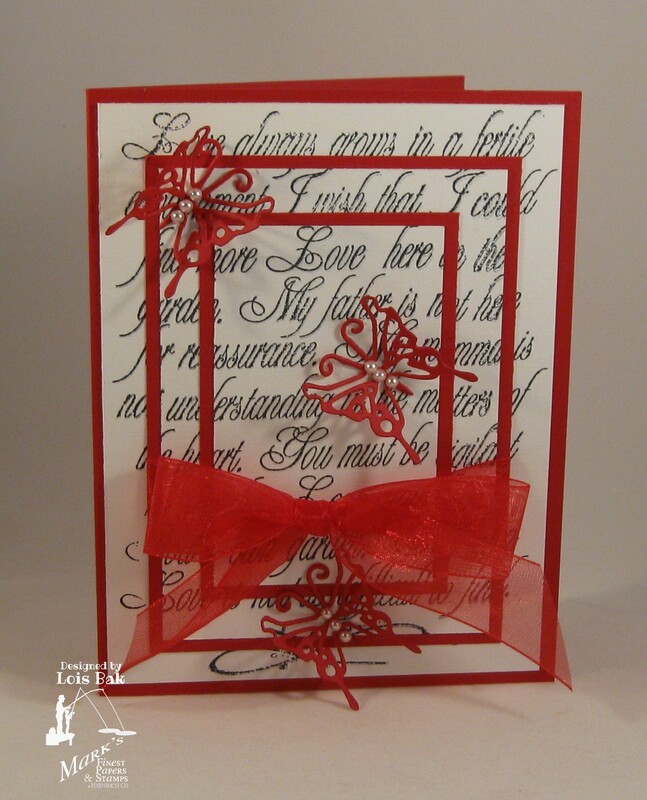 After matting with the red cardstock, I tied the red ribbon around the two smaller layers and added the butterflies. It was a fairly simple card to construct. 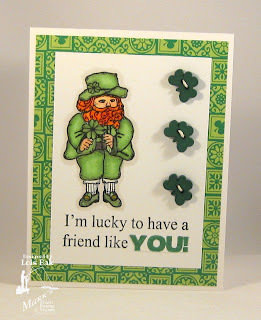 If you'd like to play along with the Speedy Fox and Friends team, make a card depicting love and link it up at the end of the post on the Mark's Finest Papers blog. 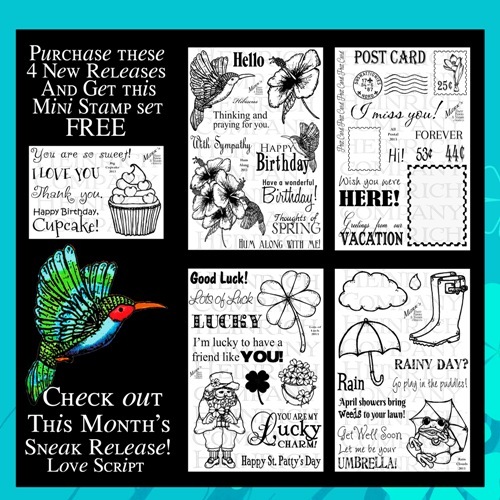 You could win a free stamp set. If you use MFP stamps, you get two chances. 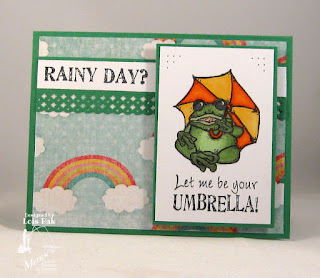 I had never heard of National Weatherperson's Day, but Frances informed the CCEE Stampers that it was February 5th and asked us to make a card to celebrate it (belatedly). 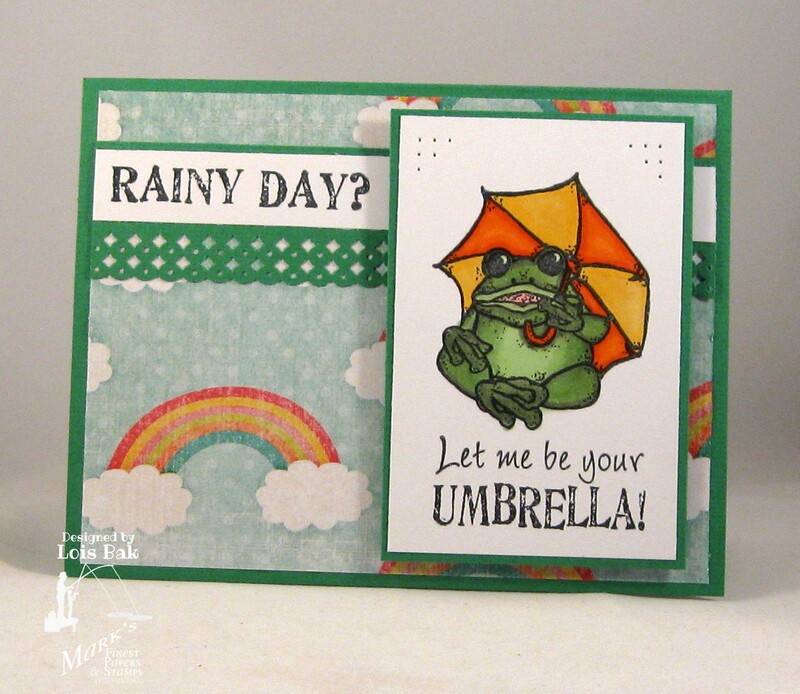 I used this opportunity to give you a sneak peek at a soon-to-be released stamp set from Mark's Finest Papers, a Heinrich Company, called Rain Clouds. Look for it later in the month. I found that cool rainbow DP on sale at Michaels last week. 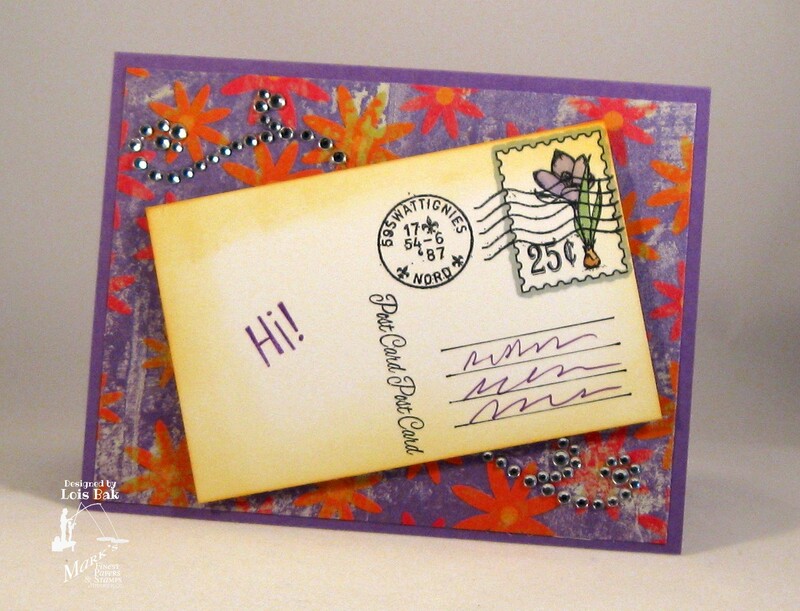 If you'd like to help celebrate Weatherperson's Day, make a card and post it on the CCEE Stampers blog. This week's Speedy Fox and Friends challenge uses a technique which I think is fun -- paper-piecing. I chose a relatively new set from MFP for my images, You've Got Style, which works well with paper-piecing. I used three different papers from a DCWV matstack called The Natural Matstack -- two for the paper-piecing and one for the background. 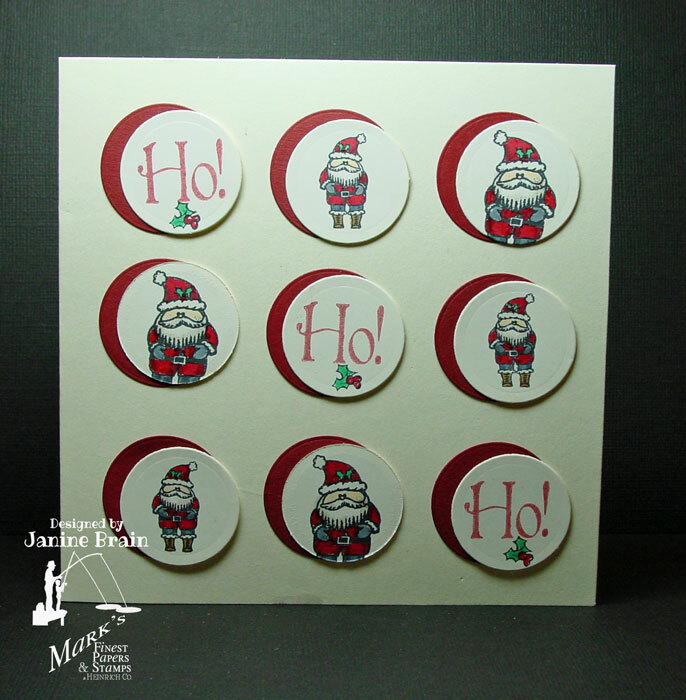 I stamped the images on the DP with Versafine Onyx Black and clear embossed them. I cut out the dark brown sections and glued them onto the printed images. 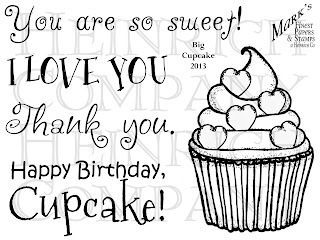 I then cut out the whole images and popped them up on the center panel of my card. If you enjoy paper-piecing or if you'd like to try it for the first time, pop over to the MFP Blog and see what the rest of the team has created -- and add your card at the bottom of the post. 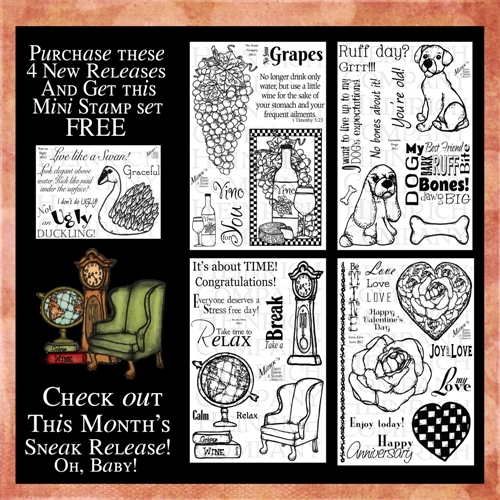 You have the chance to win a free set of MFP stamps.